As a child, Jeannell gained a passion for hair when it became her responsibility to style her mother and sister's hair. Her first sources of income in middle school was braiding and curling her friends' hair. Eventually Jeannell’s mother went natural and she struggled learning how to style it. In the summer of 2006 after a bad experience with a chemical relaxer and permanent color, Jeannell went natural. At the time there weren’t many product options on the market designed to nurture and moisturize her hair type. 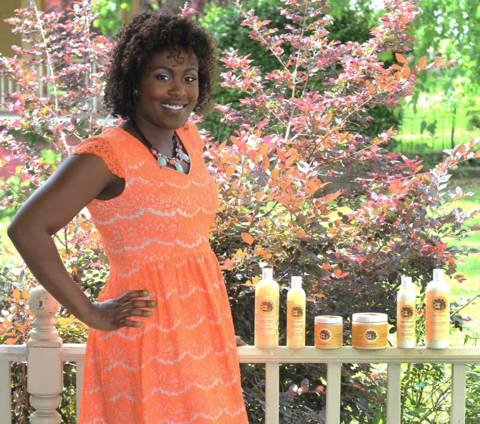 While at Georgia Tech completing her engineering degree, she re-kindled her passion for hair and began experimenting with natural ingredients like shea butter and coconut oil. The moisturizing cream can be used on your hair as well as your skin. Women love it because the styling cream does not leave a greasy residue and helps hair retain moisture for multiple days while smelling wonderful. And unlike other products, it also provides definition and does not take a long time to dry. Moisture Love "Deep Indulgence Replenishing Conditioner"
Moisture Love "Seal with a Kiss Finishing Oil"